A beautiful range of enamel costume jewellery earrings including our Indulgence Jewellery Earrings in clip on and pierced designs. Whilst gold and silver earrings are costume jewellery classics in any woman's jewel box there is nothing like spicing things up a little! Why not bring a bit of colour into your accessories by trying our beautiful enamel pierced and clip-on earrings. With many colours and styles to choose from and designs for comfort you will be spoilt for choice. Don't forget, we also have Indulgence Jewellery Necklaces too! EASTER SALE - Save 15% just enter code 388A468C at the checkout! Small stud earrings by Indulgence Jewellery in three pretty colours, pink, clear white and light blue. Pretty little drop earrings by Indulgence, with a row of colourful pastel diamanté which reflect beautifully in the light. Tiny blue flower stud earrings by Indulgence with a vibrant enamel surrounding a central pinhead diamanté stone. Beautiful set of white, light blue and dark blue flower earrings by indulgence with enamelling and tiny diamanté in the centre of each for pierced ears. A pair of pretty, small owl earrings by Indulgence Jewellery with a large central blue stone and small white crystals. 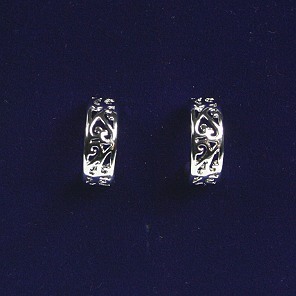 A pair of small silver coloured hooped earrings by Indulgence with a filigree pattern, for pierced ears. A pretty set of silver, gold and rose gold snowflake earrings by Indulgence, complete with subtle tiny central diamanté for pierced ears. Beautiful pair of small dragonfly stud earrings by Indulgence with purple stones and silver details for pierced ears. Dainty pair of open double heart earring studs by Indulgence in gold and silver for wearing on the earlobe. A pair of silver dainty open work flower earrings from Indulgence in a stud design. A pretty pair of small dainty butterfly earrings by Indulgence, with turquoise enamel detail for pierced ears. Small gold music note earring studs by Indulgence Jewellery, in quavers and treble clef designs finished with subtle diamanté detail. Eye catching pair of diamanté flower stud earrings by Indulgence with a cluster of raised pastel stones that reflect in the light. An unusual two tone blue enamel clip-on earring in a square design with soft ear pad for comfortable wearing. An attractive pair of small green and gold enamel pierced earrings in a half hoop style with large back fastening. A pair of enamel purple and lilac clip-on earrings in a swirling design with soft ear pad for comfortable wearing. An eye catching pair of blue two tone earrings with gold details for pierced ears. Large back fastening. Stunning clip-on gold earrings in light and dark contrasting shades in a flower design. A pretty pair of burgundy and golden cinnamon earrings with rows of diamanté in a gold setting. Large back fastening. A pair of green and light gold clip-on enamel earrings in a diagonal wavy pattern with soft ear pad for comfortable wearing.